This bundle includes the nintendo switch console, dock, joy-con (l) and joy-con (r), two joy-con straps, one joy-con grip, hdmi cable, ac adapter, and a download code for mario kart 8 deluxe | in addition to providing single and multiplayer thrills at home, the nintendo switch system also enables gamers to play the same title wherever, whenever and with whomever they choose. The mobility of a handheld is now added to the power of a home gaming system to enable unprecedented new video game play styles. | ratings applicable to game software only; esrb rating: everyone with comic mischief | hit the road with the definitive version of mario kart 8 and play anytime, anywhere! Race your friends or battle them in a revised battle mode on new and returning battle courses. 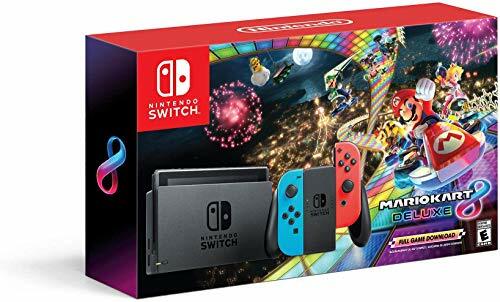 | this bundle includes the nintendo switch console and nintendo switch dock in black, with contrasting left and right joy-con controllers-one neon blue, one neon red. It also includes all the extras you need to get started. Nintendo switch with neon blue and neon red joy-con controllers: nintendo switch is nintendo's latest home video game system. In addition to providing single and multiplayer thrills at home, the nintendo switch system can be taken on the go so players can enjoy a full home console experience anytime, anywhere. The mobility of a handheld is now added to the power of a home gaming system, with unprecedented new play styles brought to life by the two new joy-con controllers. At home the system rests in the nintendo switch dock, which lets you play with family and friends on a tv in the comfort of your living room. By simply lifting nintendo switch from the dock at any time, the system instantly transitions to handheld mode, and the same great gaming experience that was being enjoyed at home now travels with you. The portability of nintendo switch is enhanced by its 6.2-inch screen, which displays bright, high-definition gameplay at the park, on an airplane, in a car, or at a friend's apartment. Nintendo switch comes with two joy-con controllers that can each act as a standalone controller with an analog stick, a full complement of face and shoulder buttons, built in motion-sensing technology and hd rumble. They can be inserted into a joy-con grip accessory to be used like a traditional controller, held comfortably in each hand for independent left and right motion controls, or shared between two players for instant multiplayer gaming in front of the tv or out on the go. Sku details nintendo switch console nintendo switch dock joy-con (l) and joy-con (r) two joy-con strap accessories one joy-con grip hdmi cable nintendo switch ac adapter mario kart 8 deluxe full game download insert esrb rating: everyone with comic mischief.